Could the type of brush I use actually help me save time blowdrying my hair? The Goody QuikStyle Half-Round Styler Brush claims to help speed your styling routine while adding body. This product claims to be like a towel and brush in one. According to the Goody website, “super absorbent microfiber bristles interact with wet hair like a towel removing 30% of water, while the half-round shape makes it the perfect blow-out brush.” The convex half-round shape allows hair to curl around the microfiber base, removing water while adding lift and body as you blowdry. The Comfort-flex grip and slim profile offer ease and control during your styling routine. Use it out of the shower to detangle, remove excess water, and style with or without a blowdryer. 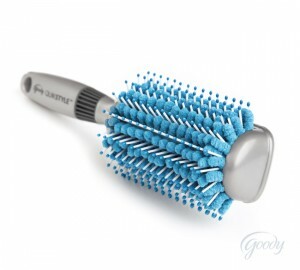 When I was asked to review the Goody QuikStyle Half-Round Styler Brush I was excited. Although I enjoy doing my hair and makeup, I’m usually pressed for time in the morning. Therefore, I’m always looking for ways and products that will give me beautiful results in less time. I did twelve timed hairdrying/styling trials – six trials timing how long it took to dry/style my hair with my regular brush and six times using the Goody QuikStyle Brush. 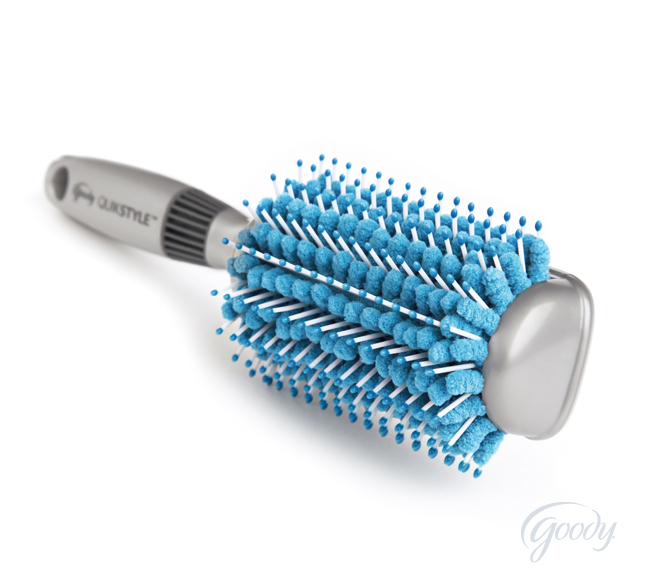 The Goody QuikStyle Half-Round Styler Brush did collect water from my hair. After I used it I would feel the microfiber bristles and they were always damp. The brush was easy to style my hair with and it did create the lift and volume that I love. Unfortunately, my drying/styling time was not any less with the Goody QuikStyle Brush than with my regular brush. Because the Goody QuikStyle Half-Round Styler Brush did not help me style my hair any faster, as it claimed, Pretty Proof is only giving this product a 2 crown rating. *A sample of this product was provided to Pretty Proof as a PR consideration in exchange for an honest review of the product. Thanks for the review of this! I saw this in the store and wondered if it really worked. Love your site and all the reviews!